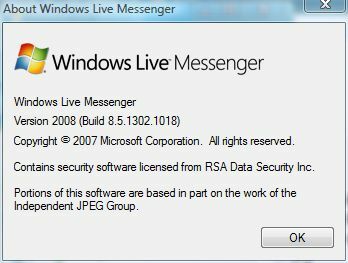 The final version of Windows Live Messenger (MSN Messenger) 8.5 with build 8.5.1302.1018 has been released since November 2007. Probably as a way to promote bundle of Windows Live products and services, new or upgrade installation of Windows Live Messenger 8.5 will be done by an integrated Windows Live installer, which also offers other Windows Live applications. Beside, Windows Live Installer is just a setup loader that will subsequently download the actual WLM installation files, thus during installation, online Internet access is required. As usual, Windows Live Messenger 8.5 can be downloaded and installed from http://get.live.com/messenger/overview (no longer available). However, for users who want to install Windows Live Messenger 8.5 in offline computer, or wants to skip unnecessary steps related to other Windows Live products, Microsoft does not provide direct download link from its server. However, users can still download the original standalone setup installer for Windows Live Messenger 8.5 from external link (English 16.3 MB). Even if you’re not downloading and installing manually from links above, users using old version of Windows Live Messenger will be offered to upgrade to latest version of WLM 8.5 in the near future. The upgrade to final version is compulsory for users using WLM 8.5 Beta. But note that Windows XP 64-bit or Windows 2003 Server users won’t get the upgrade, and are suggested to downgrade to use Windows Live Messenger 8.1 instead, as these operating systems won’t be supported by future Messenger versions. Update: The downloa dlinks to Windows Live Installer (WLInstaller.exe) version 8.5 no longer active. The new Windows Live Messenger 2009 is now available as part of Windows Live Beta Wave 3 public download, with WLM version 14.0.5027.908.